Updated Thursday December 27, 2018 by Tracy Riepl. 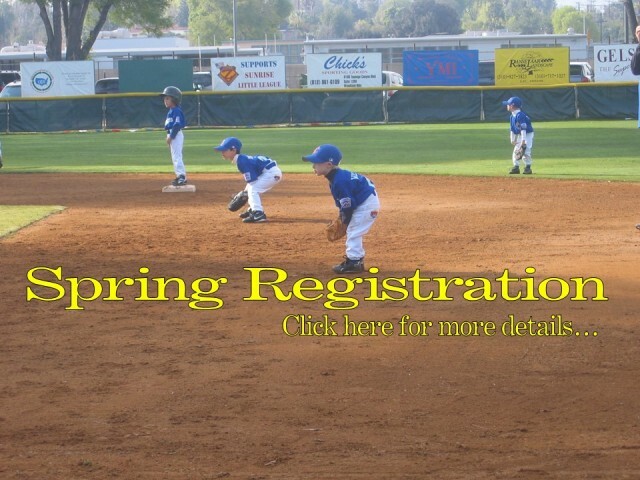 Online registration is still open however a late fee will apply to league age 7 - 12. There is no late fee for Wee Ball, Tball or Challenger. Space is limited for all baseball divisions and if you register after December 16th you will incur a $45 late fee if space is still available. If not, you may be placed on a wait list. The Challenger Division is a separate division of Little League to enable boys and girls with physical and mental challenges to enjoy the game of baseball. IMPORTANT NOTE: If you played at SLL last spring and lived within our boundary and have moved and now live outside our boundary please contact Tracy Riepl at registrar@sunrisebaseball.com to apply for a waiver through District 40. THIS ONLY APPLIES TO THOSE WHO LIVED WITHIN OUR BOUNDARY LAST SEASON. There is a $30 processing fee for any child who registers to play and then decides to drop prior to the draft. No refunds will be issued after the draft and once teams are selected. Please refer to our FAQ page to see answers to most questions. If you have any further questions about SLL please email our registrar at registrar@sunrisebaseball.com. The Challenger Division is a separate division of Little League to enable boys and girls with physical and mental challenges, ages 4-18, or up to age 22 if still enrolled in high school, to enjoy the game of baseball.